At Hampton, osiers were grown and harvested for basket making on Platt's Eyot until about 1884. The Immisch Company established a business building electric launches here (see last image). 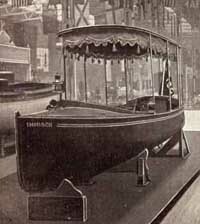 Later, Thornycrofts took over and built Coastal Motor Boats. One of these, whose Commander, Lieutenant Augustus Agar was awarded the Victoria Cross for his part in a daring night raid on Petrograd in 1919, was displayed on the island for a number of years. It can now be seen at the Imperial War Museum at Duxford. 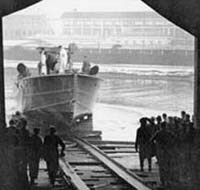 Coastal Motor Boats (CMBs) were introduced into the Royal Navy during World War I. They had shallow draft and high speed: 35knots, and were designed to slip into enemy harbours, fire off one or two torpedoes and make a quick getaway. They were used in the 1917 Zebrugge action but CMB4, displayed for many years with a Victoria cross painted on the side at the Thornycroft works on Platts Eyot, earned its fame for its involvement in the British naval action in the Baltic in 1919. This was against the Russian �revolutionaries', and it contributed significantly to the independence of the three Baltic states, Estonia, Latvia and Lithuania. CMBs had been sent to the Baltic not only as fighting boats but also to land and take off British agents sent ashore to try and understand a confused situation. For this their crews wore civilian clothes. However, the action which earned CMB4 its place in history arose when her captain, Lieutenant Augustus Agar, noticed there were �Red' cruisers which could be attacked. On 17 June 1919 he took CMB4 with a crew of two: Sub-Lieutenant J Hampshier RNR and Chief Mort Mechanic Mr Beeley RNVR, all now in uniform again, towards Petrograd. When off Tolboukin Lighthouse he saw clearly a destroyer screen through which they had to pass to reach a position to fire at a cruiser. see black hulls and waited for the gun flashes. We were a 'dead sitter' but, luckily for us, remained unseen'. The Oleg sank in twelve minutes, albeit with the relatively small loss of only five of her crew. Two days later Lt Agar was flown over the area and was delighted to see her lying on her side. He was awarded the Victoria Cross. Hampshier was awarded the DSO and Beeley the Conspicuous Gallantry Medal. After the action CMB4 was brought back to Britain where she was shown for a while at the Imperial War museum and then returned to her makers who put her on display at Platt's Eyot. When their works there closed she was passed back to the War Museum. The story of the Baltic action is told in Cowan's War by Geoffrey Bennett published by Collins in 1964, reprinted as Freeing the Baltic by Birlinn in 1992.